Near this time last year, I started on a small 40" whole cloth quilt with the hope of finishing it by the December 1 deadline to enter it at spring Paducah. 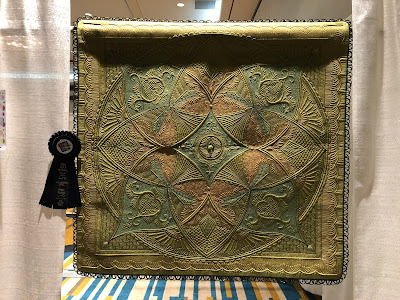 It was the second quilt I will show in this post, in green silk. Long story short, in about October I felt that it was having insurmountable issues that I did not want to battle. I had used white batting despite the quilt having a black backing fabric and there were lots of batting pokies. 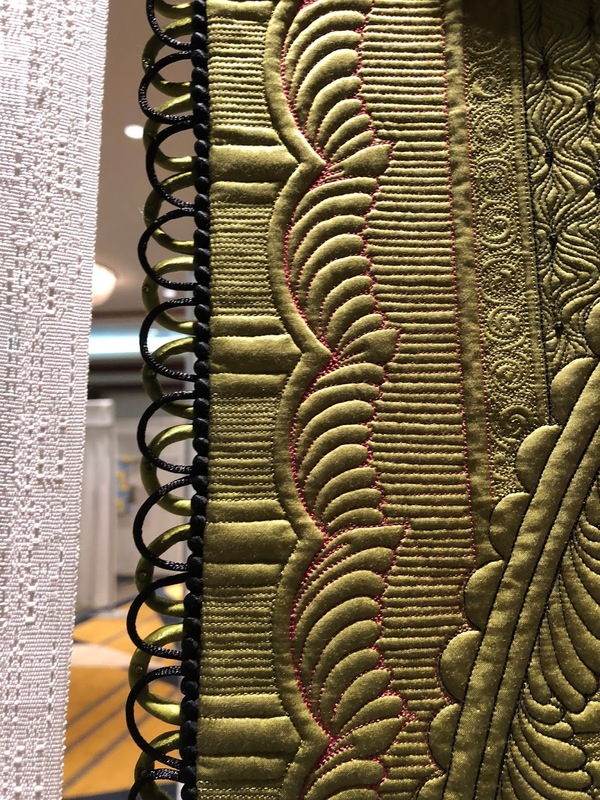 I also chose a daring black thread for much of the quilting, and highly contrasting threads are difficult to execute cleanly. 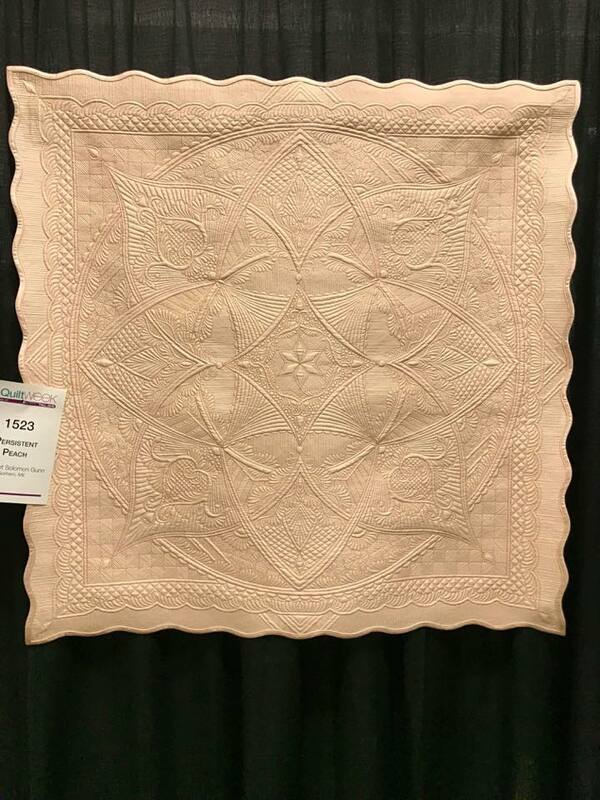 I pulled a piece of peach silk from my collection (that is the correct word if you don't want to be viewed as a hoarder, which is really more appropriate when discussing how I "collect" silks). I marked the same quilt design as the green quilt and decided to quilt a second whole cloth, this time with matching thread. In November of last year I was nearly done, but I was so PO'd with part of the binding which just didn't lay properly, that this quilt too went into a bag. The upshot of these not-so-fun adventures is that there was no Paducah entry for 2018. 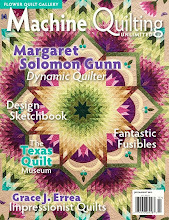 In the late spring of this year, the magazine I have written for for almost 5 years (Machine Quilting Unlimited) decided to stop production, leaving my writing days in limbo. 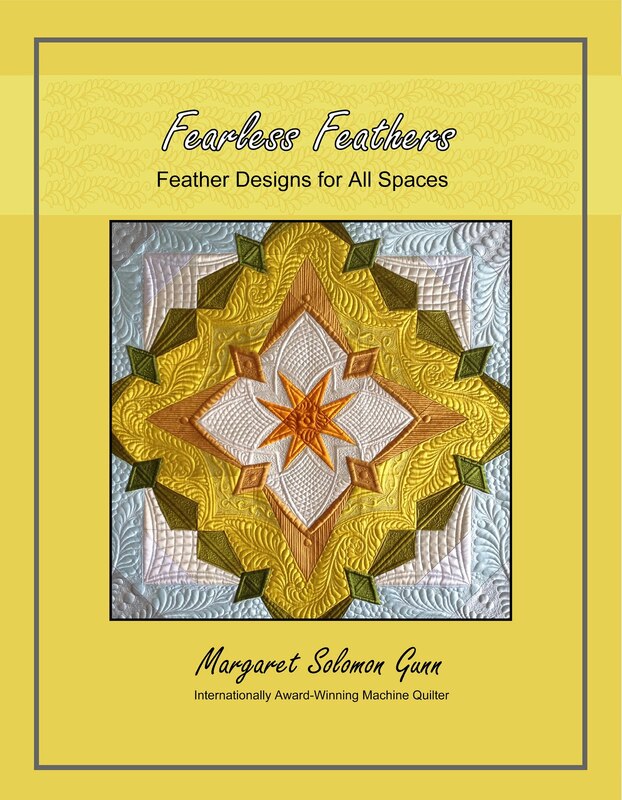 I had just about completed an article about making a traditional whole cloth quilt, and it used both of these quilts, as well as my 2 previous quilts. When one door closes, another opens. I quickly contacted AQS to see if they might publish it. The rest is history because it went to print in the last edition of their magazine. Somewhere in that process, I decided to rip off half of this binding and fix it. 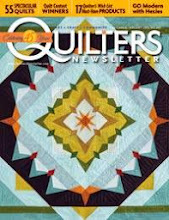 The quilt went to AQS in KY for photography for the article and has been there since, attending their summer/fall shows. It has yet to ribbon, but the finished quilt is pretty and up to my standards. 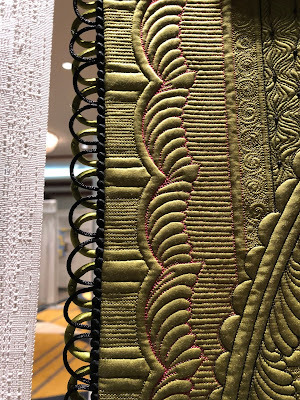 It is stitched with 40wt poly threads and 100wt Invisifil for small scale details. When I was done, I added a detailing in a rose 30 wt silk thread (not in these pictures) using my domestic machine. Many of the key motifs were outline stitched. It was finished with a couple dozen hot fix pearls, keeping the detailing classic and simple. 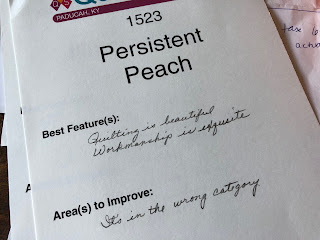 Persistent Peach was the second of these quilts stitched, so I chose to do a few things differently from the first, which I will show in a minute. The basic frames and feathers are the same, but fills are different. 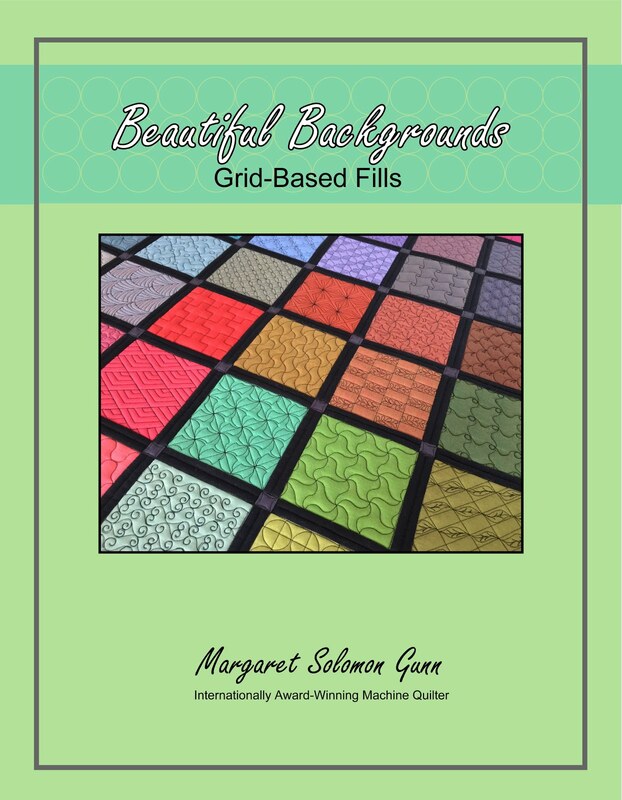 I love how the wider point crosshatch plays with the dense box fill. Scale differences are so important with neighboring fills. Here she is hanging at fall Paducah. The judges comments suggest it didn't do well because it was in the incorrect category. With no better or more appropriate category for the quilt, I chose "Art". 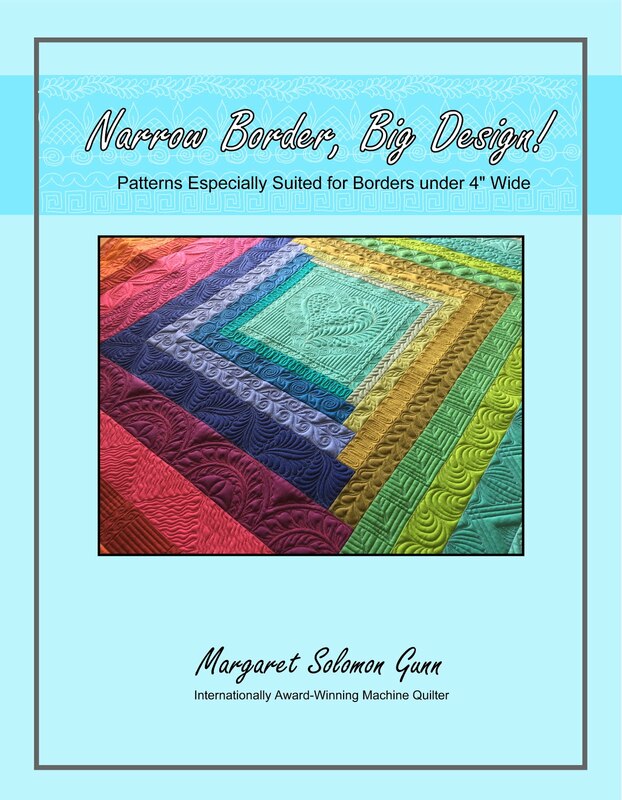 It turned out to be large, with over 50 quilts, and apparently a poor choice. Wish that those who juried had caught this. Oh well. The upshot from their comments is that it is well made. 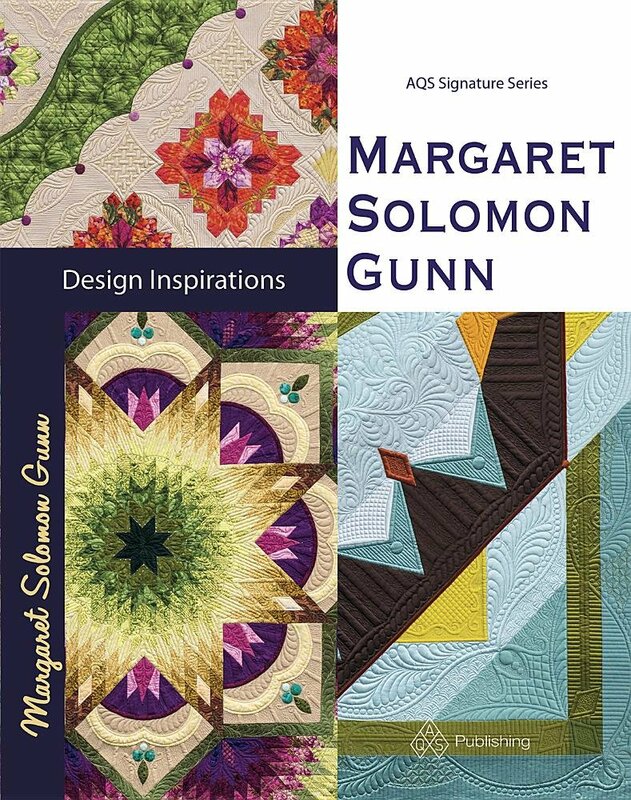 The second quilt (green one) is named Persistence. I probably should have named it "Crazy Bat just couldn't get me right, but here I am anyway". It was at MQX Midwest last week, and came home with a sparkling 1st place ribbon. Looks like despite my initial worries, I did something right on it. If you scroll back a few posts, I did document how I finished this binding -- a definite first and last for me. It was fiddly, and more work than I really wanted. What better place to try something different and untested though than a small quilt that you are somewhat uncommitted on anyway. 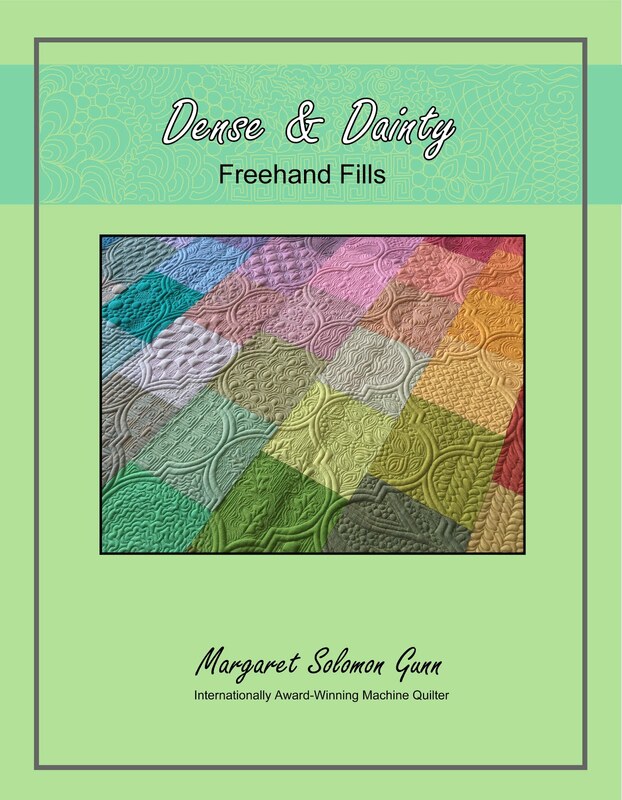 You can notice the differences in the quilting between the quilts, even though the main "bones" are similar. In the end, I love the effect of the black thread. I added 30wt silk black thread detailing on this quilt too. It is heavy enough to reinforce the frames. One of my hurdles on this quilt was the center. I think it was quilted and unpicked 3 times. Here is the original. It was removed because I couldn't get the star centered. I think I requilted the star at least one more time before realizing that something was amiss. Plan B is below. Yes, I know the circle is not quite at the center. Damn. THAT quilting is not being removed though. I was starting to see damage on the fabric. I searched for a broach to stitch on, but they all seemed bulky. Plan C involved appliqueing a circle to the quilt, falsely creating the center where it belongs. I know that this is technically not a whole cloth any more, which is fine because I have the peach quilt which is. At MQX, this was entered in Small Wall. Often the presence of another color on the binding disqualifies it from whole cloth anyway. 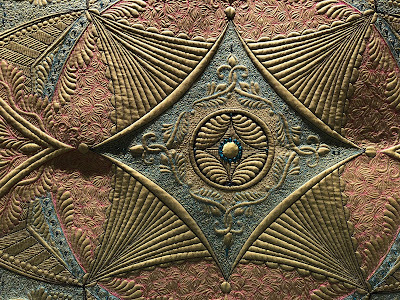 Crystals were added around the circle to hide the fact that it is applique, and to draw the eye to the center. I am glad that the two quilts are done. 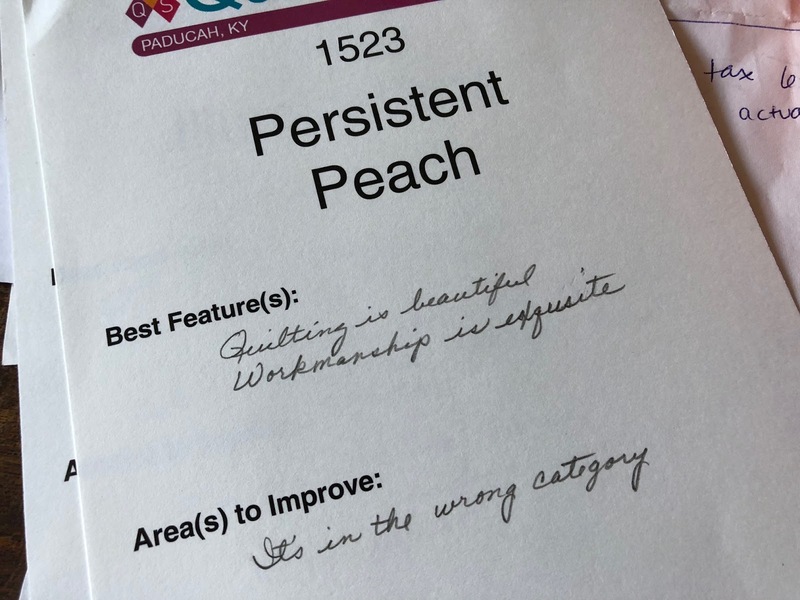 Persistent Peach will be at AQS's Virginia Beach show next week, while Persistence is at PIQF the following week.